Loch Shiel in the Scottish Highlands. 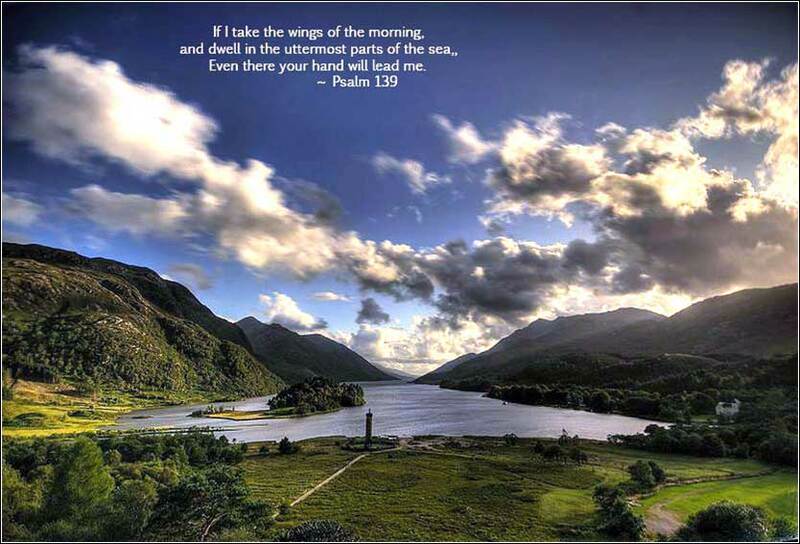 The verse is from Psalm 139. 328 people in our community are currently praying with you. "Unforgiveness is like drinking poison and hoping the other person dies." Jesus said, "Very truly, I tell you, you will weep and mourn, but the world will rejoice; you will have pain, but your pain will turn into joy. Very truly, I tell you, if you ask anything of the Father in my name, he will give it to you. Until now you have not asked for anything in my name. Ask and you will receive, so that your joy may be complete." Christianity is the ultimate expression of 'delayed gratification'. Many martyrs have given their lives for their faith in Christ, and anyone who believes in Christ will take some action in this life that is contrary to his self-interest in the world, because of his belief in the joy that will come to his eternal soul. For most of us, Christ's burden is light and the reward is great. "Life is not fair" — but in this case the unfairness runs in our favor. We are given the same eternal salvation as those who were crucified, those who were thrown to lions, and those who spend their entire adult lives as monks and nuns, living in poverty and discomfort. In fact, sometimes Christ's "burden" is an earthly blessing, especially for those who feel God's Holy Spirit in their lives. Every person's life is full of cares and woes. When we really can grasp the significance of our salvation, they do not hurt so much. Christ did say, "Come to me, those of you who labor and carry heavy burdens, and I will refresh you."